Been working on objectives for work (all day yesterday including an evening faculty potluck), and work all day today on the book project. I'm pooped. But...I still got something running through me because I painted this lil' one. About 3.5 x 4, so very small. I thought after all the work for others, I'd be selfish and paint something of my own. I've been sketching all day long, so wanted to paint. I'm surprised I did color tho, was planning on just sepia. But what fun is a quilt when it's b/w?! 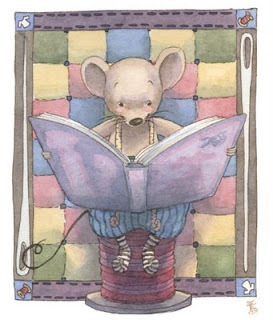 I just love love love the quilting mouse. I adore the mice in your other drawings too, I just can't get enough of them.